Lazy days are something I rarely grant myself the freedom to enjoy. But after weeks of busyness and a schedule that has me running from place to place, sometimes a lazy morning is exactly what’s needed. And what better way to indulge in a day off than to enjoy freshly baked cinnamon rolls. When it comes to these morning pastries, the phrase Go Big or Go Home comes to mind, well kind of. I mean, I’m already home, and I’m going big too. So. There. …. have I mentioned these cinnamon rolls are oversized? Not only are these cinnamon rolls oversized, they are swirled with intricate layers of cinnamon and topped with a well balanced creamy, sweet frosting. One of my favorite things about these rolls is that they can be prepared the night before. You can even slip out of bed half awake in the morning to let them finish rising. As the smell of cinnamon wafts through your house, you’ll have enough time to brew a pot of coffee and prepare the decadent frosting. When it comes time to layer on the frosting, don’t be shy; it’s part of what makes these treats so special. Once the rolls finish baking and you’ve adorned them with frosting, grab a cup of coffee and head back to bed to enjoy the warmth of your covers and a good book. 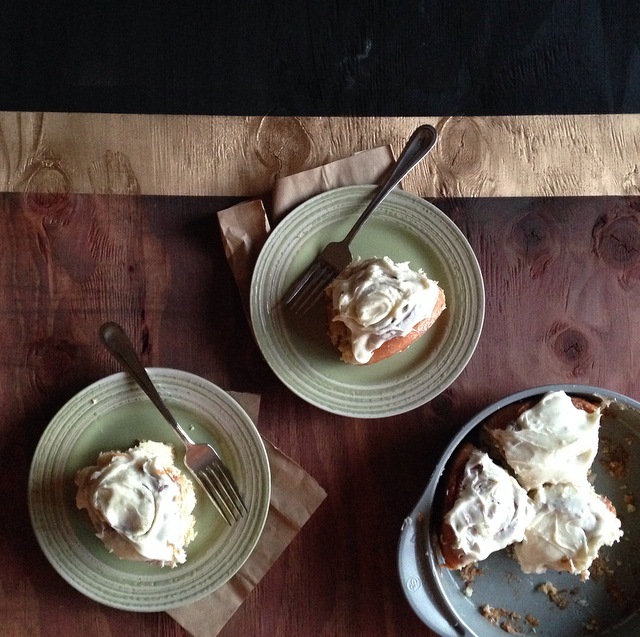 To treat yourself to these cinnamon rolls, head on over to Lovely Little Kitchen for the recipe. If you want to make these rolls oversized, like I did, simply cut the dough into 8 sections instead of 12. For an extra punch of cinnamon, I also added 4 tablespoons to the filling instead of the recommended 2-3. This entry was posted in Pastries and tagged baking, breakfast, cinnamon, cream cheese, frosting, pastry, rolls by whiskandasmile. Bookmark the permalink.